Persons who live, work, worship, attend school in, and businesses and other legal entities located in the underserved areas of Clay, Lowndes, and Oktibbeha Counties, Mississippi. 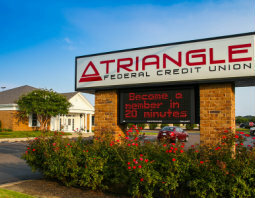 The following Select Employee Groups have been approved and are sponsor companies of Triangle Federal Credit Union. Employees of all sponsor companies are eligible for membership in TFCU along with their immediate family members. If your business or employer would like to become a sponsor company, please contact John Gibbons at jgibbons@trianglefcu.com. Columbus Lock & Key, Inc.
East Lowndes Water Association, Inc. Spouses of persons who died while within the field of membership of this credit union; employees of this credit union; persons retired as pensioners or annuitants from the above employment; volunteers; members of the immediate family or household; organizations of such persons and "corporate or other legal entities in this charter."